To make the BBQ sauce, whisk together dark brown sugar, 1/2 cup soy sauce, 2 Tbsp water, rice vinegar, 1 1/2 tsp sesame oil, chili paste and onion powder in a small pot. Heat over medium until it boils. Remove and pour a small amount of the liquid into a bowl with the cornstarch. Whisk vigorously until the cornstarch is well incorporated and there are no lumps. Stir back into the pot and bring back up to a boil. As soon as it starts to thicken, remove from heat and let cool. Meanwhile, heat 1/2 Tbsp canola oil and 1 tsp sesame oil in a large skillet over medium-high heat. 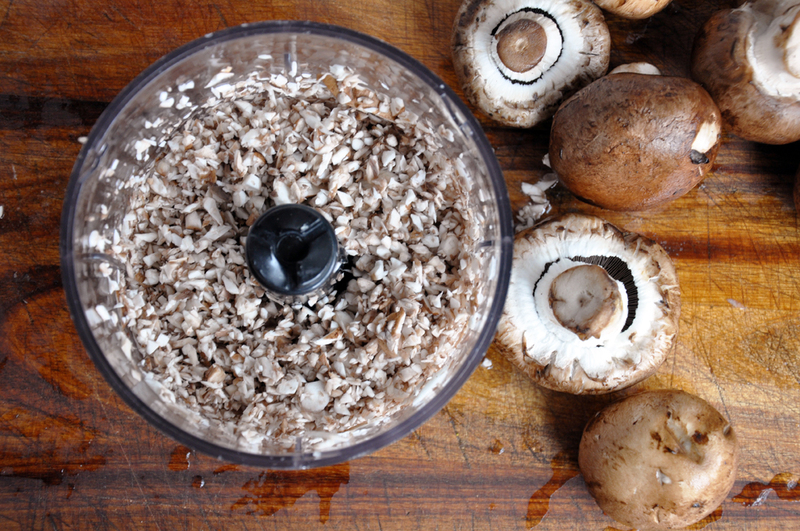 Add the mushrooms and cook for 5 minutes. Then add the asparagus and cook for 5 more minutes. Turn the heat to medium and mix in the ginger, garlic and Chinese Five Spice Powder. 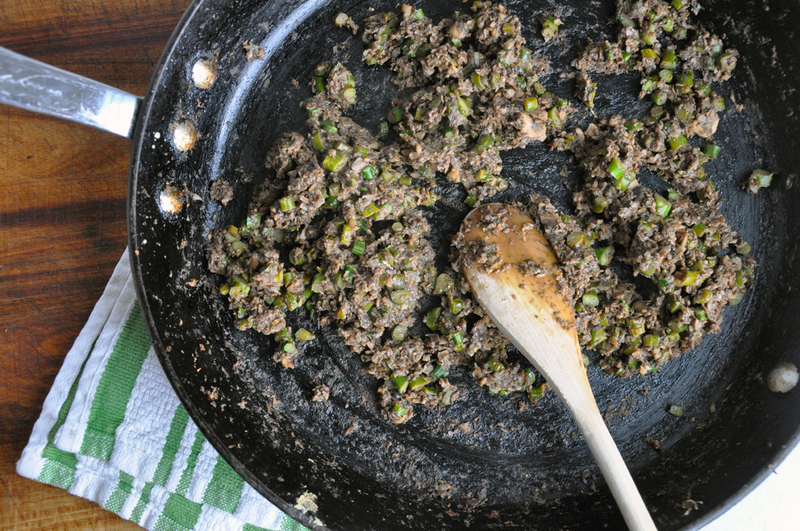 Cook 1 minute, and then deglaze the pan with the sherry vinegar and 2 Tbsp soy sauce. When the mixture is almost dry, about 8-10 minutes later, remove from heat and let cool slightly. Add the scallions and 2 Tbsp of the BBQ sauce. 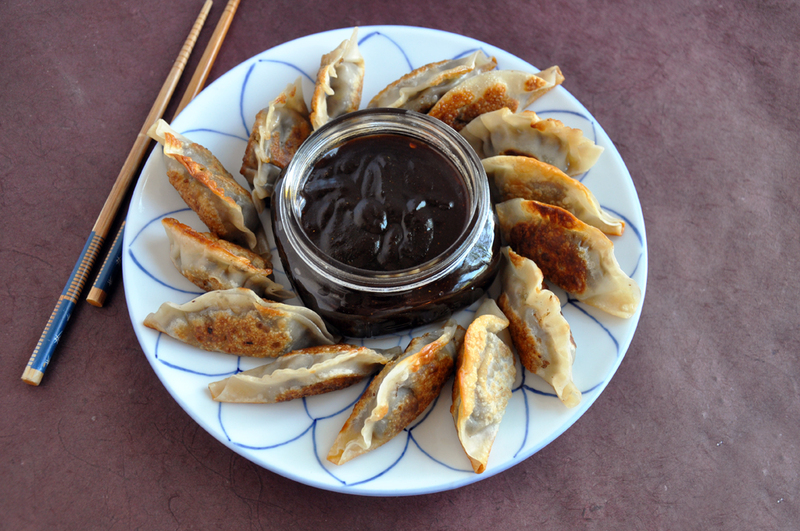 To make the pot stickers, spoon 1/2 Tbsp of the mixture into the center of a wrapper. Moisten the edge of the wrapper with a bit of water. Fold over into a half moon and seal securely. 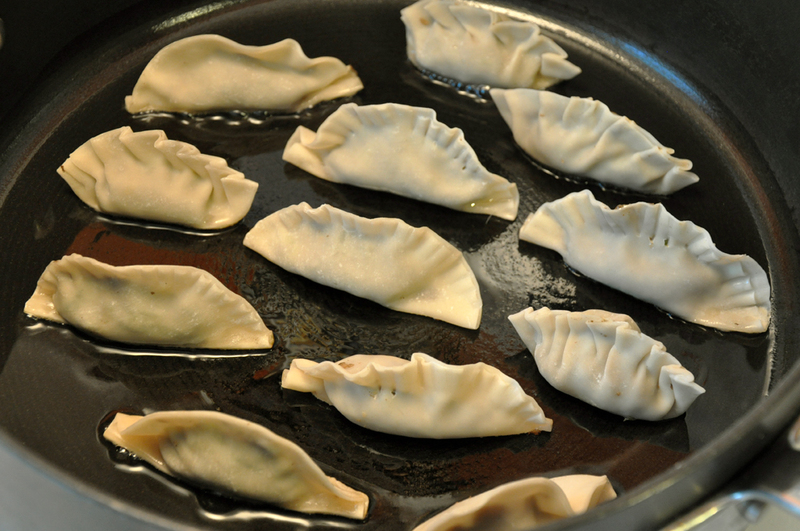 Watch my short video to quickly learn two other pot sticker folds. Heat 1/2 Tbsp canola oil and 1 tsp sesame oil in a large skillet over medium heat. Add 1/2 the pot stickers with the half moon side up and cook on all three sides until browned. Remove and drain on paper towels. Repeat with the remaining oils and pot stickers. Serve with room temperature BBQ sauce.